Camping may not be your first choice when it comes to choosing a holiday or weekend away but you should never underestimate the huge benefits that come with camping. We give you 10 reasons why you should give it a go! I’m not sure why he didn’t think camping and I would be a good fit. I love the outdoors, my Mum was always telling us to “get some fresh air” during the school holidays, I’ve always loved physical activity and the fact that I wouldn’t need to wear make-up or use a hair dryer for the duration seemed perfect for someone who brushes their hair once a day! Nothing brings you closer than camping. Whether we’re sitting outside playing cards, chatting over melting marshmallows or stomping through the woods – it’s all about being together, having fun and talking to each other without the usual everyday distractions of phones and social media. Immersing yourself in outdoor living and eliminating distractions is easier than you think! Just live in the moment with the people that you love and you’ll be all the better for it. Whether you are holidaying with friends or not, camping is super sociable. There’s something about the outdoors that makes it so much easier for adults and children to socialise and interact with each other. Every time we go camping, within half an hour the kids are whizzing round the campsite having made some new-found friends! When I think about what we do in a day when camping, I’m surprised we’re even standing at the end of the day. A single day can consist of a bike ride, paddleboarding, swimming at the pool or by the beach, table tennis and badminton. The physical activity that comes with an outdoor lifestyle is one of the huge benefits – we’re burning calories without even realising it and to top it all off we all absolutely love it! It won’t come as any surprise that my children sleep really well when we are camping. The combination of fresh air, all the activities and admittedly the odd later night means that they sleep soundly past our usual 6:30am wakeup call! Whether you are putting up your own tent or trying a new activity, it’s amazing how much you can achieve on a camping holiday. 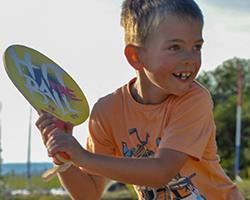 Both my children learnt to ride a bike whilst camping in France, they’ve learnt how to sail and played table tennis and boules for the first time. There have been so many amazing firsts when it has come to camping! Being surrounded by nature, forests and wildlife really does ignite the sense of adventure in youngsters and adults. Camping gives you both the freedom and confidence to explore and try new things. Being outdoors can really boost your mood and relax your mind. Sometimes when life just feels like endless meetings, car journeys and shopping trips, it’s nice to take a step back and put it all in perspective. If you feel like you are burning out, sometimes all you need is a camping trip to clear your head, improve your mood and allow you to return home more positive and receptive to change. I have watched over the years as my own children have grown in confidence purely from the kind of outdoor lifestyle we are giving them. 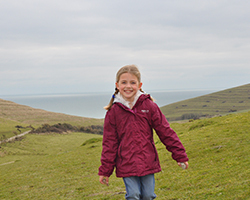 I see it every day at Rockley and hear it both from teachers and parents about how their children/pupils have really developed as individuals, how they have shone and exceeded beyond all expectations because of the camping trips they have experienced. Last year, the teachers from Poole High told us how a young boy had never ridden a bike before but learnt this life skill on a Rockley trip. My own daughter who once refused to get in to a dinghy now will just set off with her friends and informs me she’ll see me later. I love the fact that facing these new challenges brings out the best in children and adults. 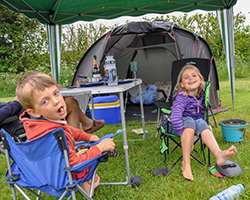 Without having to stick to deadlines and meetings or negotiate your children’s very busy social lives, there will inevitably be more freedom to relax and enjoy the simplicity of camping. Nature itself is inspiring so by kicking back and taking in your surroundings, it will not only improve your mood but also certainly spark your creativity. At a time where it feels like we are battling to save the environment from years of damage and neglect what better way to teach our children to love, care and appreciate the environment than be immersing them in it. If we appreciate the beauty of nature and provide the opportunity for our children to embrace it then we will all care more about protecting it for future generations.